Protect Your Investment! The Only Weather Cover That Securely Protects a Trampoline WITH a Safety Enclosure! The ONLY weather cover you can use without removing your JumpSport or AlleyOop Sports safety enclosure! Easy to use one-piece design uses Velcro®-like material and buckles to secure to the trampoline. Lays across bed of trampoline and easily installs around each of the enclosure poles. Made of Heavy-Duty PVC-Coated Polyester – the same material used with many Outdoor Marine Canvas and Commercial Awnings! Choose your size: JumpSport or AlleyOOP 10×17 Rectangular, or 12ft or 14ft round trampoline frames with 4 U-legs. 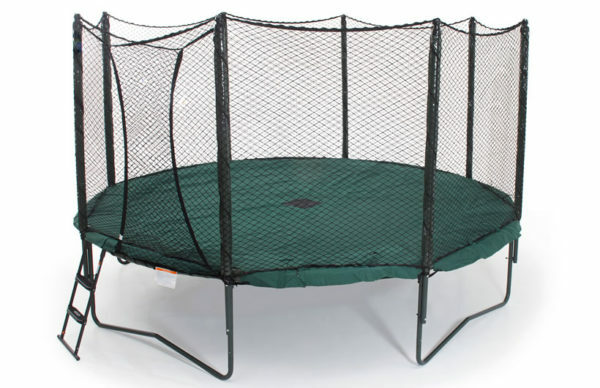 Available for 12′ round, 14′ round or 10’x17′ rectangular trampolines! Protects your trampoline bed and safety pad against harmful UV rays & keeps your trampoline free of leaves.